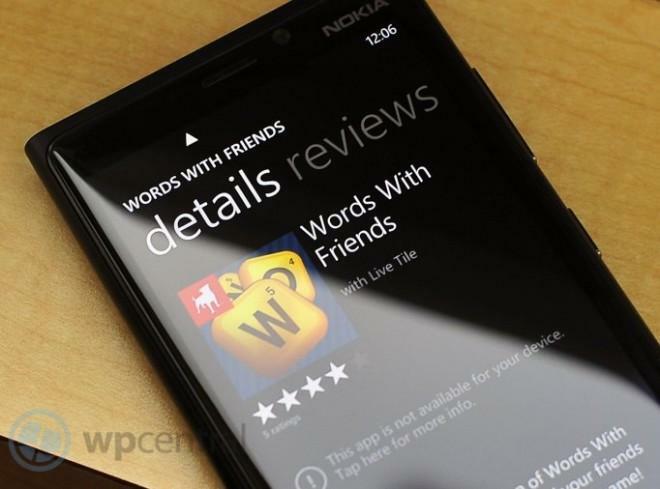 Windows Phone users on T-Mobile have a little surprise in store as WPCentral reports that Words with Friends is being offered as an ad-free version exclusively to T-Mobile customers. According to the report, not only are T-Mobile customers getting access to the game earlier than anyone else, this version has no ads to bother you during gameplay. We’ve reached out to T-Mobile to confirm the story, but it’s definitely a little bonus for Windows Phone users on T-Mobile. There’s no word on when the rest of the Windows Phone world be able to download Words with Friends, but we can’t imagine T-Mobile’s gameplay exclusive lasts for very long. Grab the game from the link below using your Windows Phone directly as it won’t work using your desktop browser. Don’t wait too long, you never know when this special offer will end! I’d rather T-Mobile put funding towards getting better handsets than a stupid game. Although its good to see the Windows Phone Store getting love from developers that ignored them before. This means a Windows Store App could be around the corner as well. blackberry 10 looks more promising than windows phone. i doubt the average joes will buy em. The poeple that usually say things like this have never even sat down with Windows Phone. It’s a great phone OS. Nothing like Windows Mobile, and that is a good thing. Except that a lot of business are done paying for a BES server so BB is going to be screwed. You mean the game people stopped playing many months ago? i still play it but i am beast at so its fun for me you people are probably tired of losing. theres a message that says “this app is not available for your device” ???? I’m gettin the same thing on my Radar. So is this just a wp8 app? I was able to get it on my Radar. No Windows 7 devices will be updated to 8. Microsoft made this clear months ago. u can upgrade it yourself. I was on eBay just checking to see why hd7 was going for,someone one on there had one on there from sale,with windows 8. Don’t ask m how he did it,you might want go to xda,see why they tell u,and Google it to see to how u can do it. Go to u tube it might be on there. I have an HD7, TMobile’s Words with Friends installed just fine. I’m excited to pickup two HTC 8Xs for my wife and I next week! The 8X and Lumia 810 are so close on paper to each other. I am going to have to go to a store and see them in person before I can decide. words with friends I still play it but i am beast at so its fun for me you people are probably tired to loosing.